I’m in Napa Valley at a PR industry conference and just attended an interesting presentation by Jason Jennings, author of "Think Big. Act Small." Jenning’s book examines the traits of those companies that have produced 10 percent increases in growth and profits every year for the past decade. Incredibly, fewer than 20 companies can lay claim to such an accomplishment. Those that can share similar traits (i.e. casusal dress codes, a CEO who gets his/her hands dirty by staying close to the customer and pursuing a long-term cause as opposed to short-term quarterly earnings). They also share one other trait: none of the great companies had a mission statement. That finding really hit home with me. I’ve always thought mission statements were totally bogus and were nothing more than warm and fuzzy statements with lots of feel good words. Just because an organization says it does something doesn’t make it so. Rather, it’s the actions of an organization that define its success, its points of differentiation and ultimately, its brand and reputation. The best mission statement in the world will fall flat if its products, people and performance are mediocre or less. I once worked for a $500 million integrated marketing agency whose mission statement was "we build brands over time and sales over night." I remember the snickering when the CEO read it out loud to us and had it posted along all the hallways. It was purely aspirational, had no basis in reality and, in point of fact, actually alienated clients, prospects and employees. The company went out of business about five years ago. Not that we’re remotely close to the organizations profiled in Jennings’ book, but you won’t see any mission statements in our hallways. That’s because we believe actions speak louder than words. Especially the words of mission statements. Jonathan Glater’s excellent article in today’s New York Times shines the spotlight on a few law firms that are finally getting serious about marketing themselves. This is significant because, like doctors, lawyers had traditionally felt marketing was unseemly and not appropriate to their business model. Declining revenues and heightened competition have forced many law firms to change their tune. Having advised many law firms, accounting firms, consultants and business schools, I know that these types of organizations can be a real challenge to "brand." For one thing, they all say exactly the same thing about their practice, range of services, years in business and managerial talent. For another, each partner is a CEO unto himself/herself. So a positive article about one partner or practice area will often engender scorn, envy or outright hostility from a different partner or practice area in the same firm. Another big challenge is that nine times out of 10, law firms cannot identify their clients by name (which the media insist upon in order to provide coverage). We typically get around that obstacle by identifying trends, undertaking proprietary surveys and having the firm host local market or industry specific roundtable discussions in order to debate issues in their areas of expertise. Law firm marketing isn’t for the faint of heart. If one can satisfy the egos involved, uncover some distinct points-of-view and, most importantly, find some nugget that will differentiate the law firm from its thousands of competitors then, dear reader, you’ve got a good shot. Your witness. I was recently scanning BusinessWeek when I saw an advertisement for Grant Thornton, a top accounting firm. 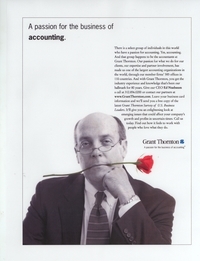 The ad depicts Kim Nunley, Grant Thornton’s office managing partner, biting down on a single red rose. The caption reads, "when you have a passion for accounting…it shows!" Well, with apologies to Ms. Nunley who I’m sure is quite passionate, an advertisement by a firm telling me their people are passionate carries about as much credibility as some guy at a bar boasting about his high school football heroics. And that’s the problem with advertising. It suffers from a lack of credibility because it’s all about a company paying money to tell you how good it is. Or how passionate its people are. To their credit, Grant Thornton did include a JD Power award citation in the ad, listing them as having the "highest audit firm performance." That’s a step in the right direction. If Grant Thornton (and other advertisers) want me to believe their firm has passionate people, don’t run photos of them cavorting with roses. Instead, print quotes of clients who have worked with Ms. Nunley and her peers and will provide third-party credibility to back up the claim. And, by the way, supplement the advertising campaign with a public relations initiative that by its very nature imparts instant credibility. In fact, surveys show that, next to word-of-mouth, public relations is the single most effective means of introducing a product or service. So, memo to Grant Thornton: please stop telling me how passionate your people are and, instead, get your clients to convey the same message. It will have an exponentially greater impact. For the last few months, Guidant Corporation has been justifiably pilloried in the media for continuing to market a model of heart defibrillator three years after discovering a potential defect in it. Only in May, when the New York Times broke the story of a 21-year-old Minnesota man whose Guidant Ventak Prism 2 short-circuited and caused a fatal cardiac arrest, did the company reluctantly issue a recall of the devices. Subsequently, another death and at least 45 non-fatal failures of the devices have been reported. Now comes the news that the Food and Drug Administration knew about the defective defibrillators months before issuing its recall notice. At least one person has died and thousands more are at risk on account of an unrepentant company, aided and abetted by an irrational federal agency whose ostensible mission is to protect the public. While the FDA received a report from Guidant disclosing the potential flaw in February, the agency did not make it public because such information is treated as confidential. The FDA’s spokesman told the Times that it would consume too many resources for the agency to review which filings should be released and which should not. If there is a monument to irresponsibility that rivals FEMA, this is it. Twenty four thousand of these devices, any one of which could short circuit at any moment, have belatedly been recalled. This is inexcusable to the point of criminality. We cannot trust the government to do the right thing when it comes to protecting our basic health, welfare and security in the face of a natural disaster, and now we discover that it withholds vital information because it’s too busy. "That’s our policy" has been policy for too long. It’s no excuse when people die. Have government bureaucrats become so insulated and callous that accountability is a foreign concept to them? A Saturday NY Times article reported that Tulane University is refusing to refund Fall semester tuition payments saying they need the money to pay faculty salaries and help with hurricane recovery. As a result, the parents of Tulane students may be stuck paying two tuitions: one for the out-of-the-state school their kid is now attending and one for good ol’ T.U. I’ve seen some bad executive decisions over the years, but Tulane’s move is right up there. I cannot believe the university doesn’t have enough money set aside to cover a short-term financial crisis. If they don’t, then there’s some financial chicanery going on. If they do, then they should think about the reputation and goodwill damage they’re wreaking by making parents fork over $20k for education their kids won’t be receiving. I think this calls for a failing grade in RepMan’s Image 101 class and at least a week’s worth of detention for the university president. Is Hollywood Totally Brain Dead? As I was working out this morning, my attention was diverted to a commercial on NBC promoting a new Tim Burton movie called "Corpse Bride." The trailer included scenes of an animated female corpse dancing around in a graveyard. The promotion ended with a note that the movie would be premiering in selected theatres nationwide on September 26th. Right after the commerical ended, Katie Couric returned on-screen to report live on the loss of life in Biloxi. Below her, across the bottom the screen, a note appeared indicating that FEMA officials had ordered 25,000 body bags for New Orleans alone. So, I ask: what in god’s name must the Hollywood marketers be thinking of? Could there be a worse time to be promoting a movie with corpses than right now? Have we become so immune to this sort of egregious, over-the-top marketing that it no longer matters? Paraphrasing one of the more memorable quotes from the 1954 Army-McCarthy hearings, "Mr. Burton, have you no shame? Have you no compassion? Sitting through yet another NY Mets meltdown last night against Atlanta, I was reminded of their advertising and marketing campaign earlier this season: "Next year is now." Convinced that their move to acquire top free agents Pedro Martinez and Carlos Beltran would produce "meaningful baseball games in September," the Metsies marketing campaign went into high gear (supplemented by boorish cheerleading on their broadcasts by Fran Healy, who seems totally detached from the grim reality of the Mets’ situation). Sadly, though, this team lacks any offense whatsoever and is dropping out of the race faster than Howard Dean disappeared from the Democratic primaries after his ill-timed yelp of joy. All of which reinforces a basic marketing truism: you can launch an intense and sophisticated integrated marketing campaign to support a product or service and do everything right. But, if said product/service is flawed, it won’t matter. The public knows a rotten product when it sees one. And I’ve seen one in Flushing. When will business and government organizations finally wake up and realize that crisis preparedness is not something you deal with after the fact? The cataclysmic debacle in New Orleans is just the latest example of a management team not anticipating and planning for the worse case scenario. I see this "it can’t happen here" mentality in business all the time. In fact, we recently partnered with a trade publication called Business Continuity Insights to survey hundreds of readers, all of whom are top corporate security and risk managers, about crisis preparedness. We asked two questions: Did they have a crisis plan in place? More than 80 percent did. Had they ever simulated a crisis? More than two-thirds hadn’t. Crisis planning isn’t a nice to have. It’s a MUST have for every single business, government, sports, entertainment, for-profit and non-profit organization. How many more times do we have to see an egregious planning and preparation faux pas a la New Orleans before the people in charge finally wake up? Last year, three of the country’s largest newspapers (Newsday, the Dallas Morning News, and the Chicago Sun-Times) admitted to falsifying their circulation numbers, resulting in circulation staff shakeups and compensation to advertisers. Now comes the news, courtesy of Advertising Age, that the magazine world is experiencing "a circulation scandal that is tearing through the industry." The latest titles to be caught with their pants down and their numbers artificially up are Martha Stewart Living, Family Circle, and House Beautiful. 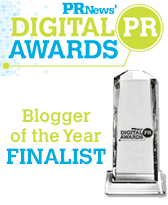 As many as one third of the leading consumer magazines may be affected, according to Ad Age. All I can do is to let out an exasperated sigh. The news media is already taking hits from all sides for ethical lapses everywhere, and now this. Perhaps, as one publisher said, this scandal could be an "apocalypse." If so, the print media should get right with itself and start thinking about its own second coming as trustworthy in word, act and deed. I have been thinking about John Bolaris in the last day or two as I watch nonstop coverage of Hurricane Katrina. Who’s John Bolaris, you might ask? He’s the unfortunate Philadelphia weatherman who received hate mail and even death threats in March 2001 after his dire predictions of a devastating blizzard turned out to be massively overstated. Well, you could attribute that to Philadelphians taking their weather as seriously as their sports, but the precedent is notable. On the Gulf Coast today, it’s the meteorological equivalent of impending Armageddon, if the cable news networks are to be believed. They sicken me with their 24/7 coverage of misery and mayhem. Yes, it’s a big story; a major American city, and one of its most culturally significant, may be devastated. Yes, the media have an obligation to let people know about loved ones in the area. Still, they go so over the top and whip up such fear that they neglect a key element of their mission, which is to report the news. In so doing, they should help people to understand it. They are not, in this instance. Not only do they relegate themselves to play-by-play announcers as they focus on the storm track, but they miss a key part of the story: that this hurricane might damage or destroy the oil refineries in the area, hastening the rising price of gas. The implications for the economy are ominous. It is hard to trust the media, and the broadcast media in particular, on this one. They have made so many mistakes in hyping past "storms of the century," and have managed to evade responsibility when nothing occurs, that the trust keeps eroding. No matter what happens, today we are all John Bolaris.